The newly available Librarians Do Research Too! is a 25-page ebooklet for Library and Information Science professionals who want to start their own research projects. 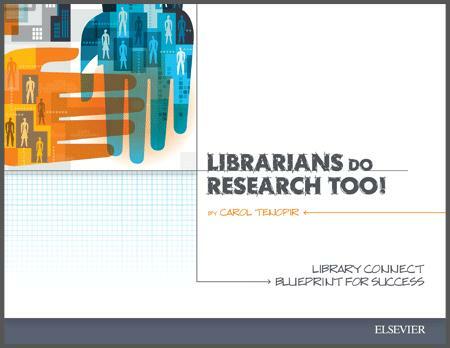 This Library Connect Blueprint for Success provides inspiration, guidance and resources from a leading LIS researcher. Author Carol Tenopir is the Chancellor’s Professor at the University of Tennessee, Knoxville School of Information Sciences. She is the author of five books and more than 200 journal articles, and is a frequent speaker at professional conferences. Her areas of teaching and research include: information access and retrieval, electronic publishing, the information industry, online resources, and the impact of technology on reference librarians and scientists. Download and share Librarians Do Research Too! Dr. Tenopir will be discussing Librarians Do Research Too! in the April 16 webinar Building a professional identity: from research to impact. Register for the webinar.